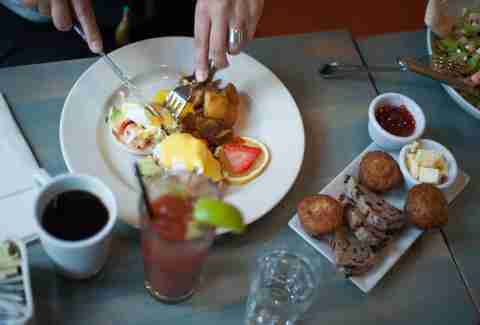 Brunch in New York City gets a bad rap. Some cynics even refer to its bottomless subgenre as amateur hour. To be fair, unlimited sparkling white wine or everclear masquerading as tequila can make any crowd unpalatable at best, and shrieky at worst. But it doesn’t have to be that way. As long as you avoid the dreaded day-drinking hangover, bottomless brunch-time can be as respectable as the more socially acceptable imbibing hour: five o’clock somewhere. As long as you make an effort to stay relatively hydrated, fortify with whatever Benedict, omelette, breakfast burrito, or maple syrup vehicle you ordered to justify mid-morning’s raison d’être, and choose from this list of eggcellent options, you’ll be a brunch pro before happy hour. If there’s any NYC neighborhood where brunch has a tendency to magnify its worst flaws, it’s the East Village -- where the culinary portmanteau can bring out the worst of the #squadgoals set. Not so at Bar Virage, where $24 buys you a fresh and healthy Mediterranean meal and an endless pour of Champagne cocktails, all served by a hospitable staff in a chill, diverse environment. And, although the bottomless booze is technically limited to an hour, nobody’s watching the clock too closely. 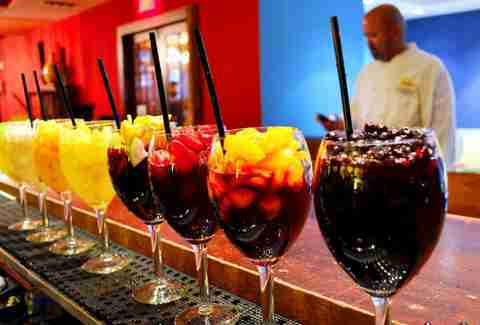 Choose from eight sangria varieties at this well-oiled bottomless brunch machine. The house rules encourage you to enjoy at your leisure (responsibly, of course) with an item from the pan-Latin menu. Pair the Puerto Rican coquito-dipped French toast with the coconut rum, banana liqueur, coconut and lychee white sangria for a sweet treat, or the Cuban skirt steak with the brandy, orange, lemon, and apple red variety for a hearty meal. This Bronx bistro boasts of being the only authentic French restaurant in the borough. Francophile or not, there are beaucoup de reasons to swing by Sunday brunch: The vibes are relaxed and romantic, and the food is prepared with obvious devotion -- their omelettes are airy perfection. Menu highlights at the TriBeCa outpost of this upscale Mexican operation include the morning tacos with scrambled eggs, braised pork and chorizo hash, and the carne asada con huevos with grilled skirt steak, yucca tots, and two fried eggs. The best part? The selection of six different margaritas, like the Mexican firing squad (featuring reposado, grenadine, lime, and spiced salt). The Hell’s Kitchen location serves a truncated, $30 version. 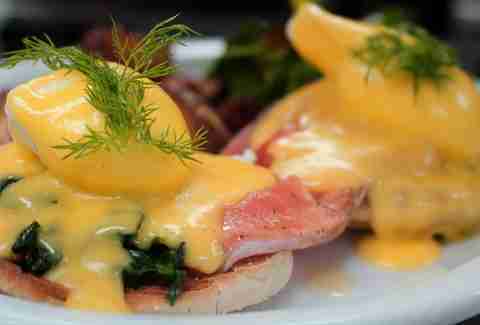 You’ll find perfectly executed classic American brunch fare like Benedicts and steak & eggs at this decades-old Staten Island staple. Brunch at Lacey’s is limited to Sundays from 12-3 pm, and while you certainly won’t feel rushed through your meal, you may have to wait a bit for a table if you haven’t made a reservation. Make yourself at home at this effortlessly cool Southeast Asian restaurant, where you’ll pour your own bottomless Narragansett to sip alongside dishes like Banh Xeo, a Vietnamese crepe with bacon and shrimp. Bottomless booze sales end promptly at 3pm. Everything about Baron’s (wrought iron, wood, pressed tin) just screams 2010s Brooklyn, in the best way possible. The modern American food here is pitch perfect, both in flavor and portion, and the staff is kind and attentive. Sit back and relax as you take in their on-brand-yet-unpretentious interiors with a Baron’s breakfast sandwich (pork sausage, bacon, egg) in one hand, and a screwdriver in the other. This Bay Ridge sports bar mainstay is known for its wings, but the brunch is really where it’s at. Almost everything on the menu (omelets, bennies, flapjacks, and skillets) comes with optional bacon or steak, and though the bottomless portion of the menu is limited to an hour, you won’t catch yourself with an empty glass for even a minute. 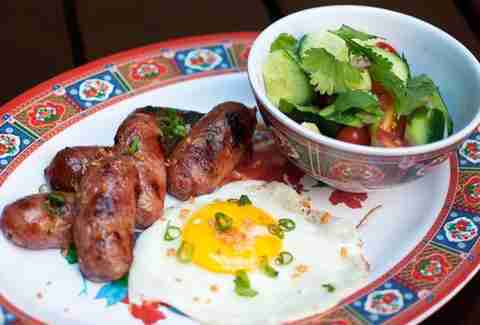 In addition to weekends, TKB is also open for brunch on holidays. There are no frills at this long-standing Woodside pub, but it’s $20 bottomless brunch is likely the best deal in the city. The buffet is hearty and filling -- brimming with corned beef hash, eggs, bacon, sausage, potatoes, and pastries perfect for soaking up all those bellinis. The buffet is only available on Sundays (you can order $11-$13 Irish staples like corned beef hash and eggs from the à la carte menu on Saturdays) and there’s a $2 upcharge for unlimited mimosas and Bloody Marys. 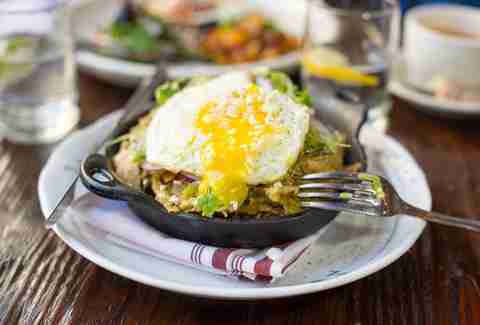 American food meets Czech brews at One Stop’s bottomless beer weekend brunch. 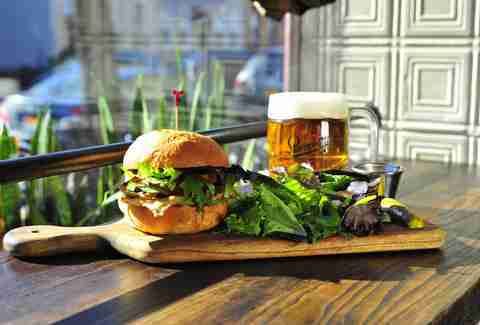 Enjoy entrees like breakfast sandwiches, a.m. pizza, and French toast, while you imbibe all the Pilsner Urquell your liver desires. The beer-averse can pair two-for-one mimosas like the redneck (a delightfully lethal cocktail of Champagne, beer, orange juice and triple sec order) with à la carte items. 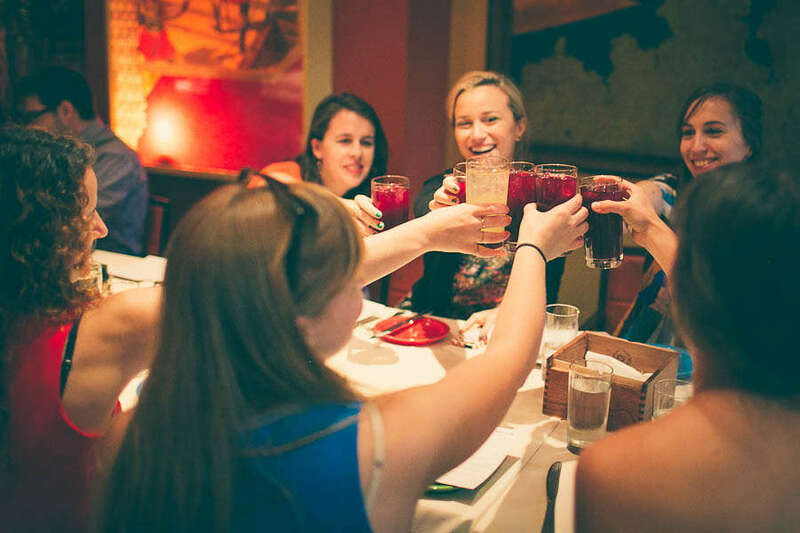 Live music, consistently flowing mimosas and sangria, and traditional Cuban specialties like ropa vieja -- served atop a to-die-for sweet corn arepa -- make this Sunday brunch worth heading uptown for. 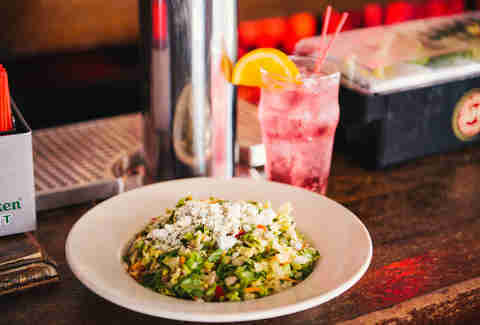 The portions are enormous, especially by NYC standards, so you will definitely feel like you’ve had breakfast and lunch by the meal’s end. Most groups wisely make the most of the two hour limit, so wait times can be long. Reservations are recommended. Sunday brunch at this farm-to-table LIC favorite isn’t the neighborhood’s cheapest option, but the quality of its ingredients make it worth the Jacksons. The duck barley (house-made duck sausage, confit, barley, eggs, and spinach) is particularly splurge-worthy on a menu full of standouts. Tequila lovers can opt for Bloody Marias -- Mary’s agave-spirited sister -- for a unique twist on the typical brunch cocktail. Step into Portalia for an enchanted weekend brunch and watch your worries melt away. Make what will hopefully be the toughest decision of your day when you choose between their equally stellar savory and sweet Italian-inspired entrees like the crostini with smoked salmon, and the Nutella pizza. Reward your effort with generous Champagne or vodka cocktail pours. Victoria Marin is a contributor to Thrillist.